The element containing the rows and columns of tabular table material. The Tag Suite default element is <table>, taken from the NISO JATS XHTML-inspired table model. Element that holds the complete table. 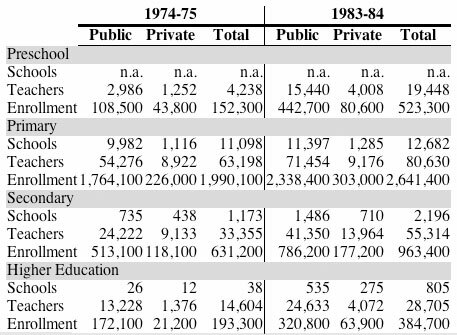 This includes the row-and-column data, table number, table caption including the table title, and any table footnotes or general notes attached to the table. If the complete table should appear in a List of Tables for the publication, then it is tagged with the <table-wrap> element. The <table-wrap> element also provides a uniform place to put information such as a table title and caption (both inside the <caption>). The element <table-wrap> can also contain a <table-wrap-foot>, as a place to put table footnotes and other information. The table models in the JATS do not allow nested tables. That is, a table cell (e.g., <td>) may not contain a table. a mixture of these elements. Some complex tables may consist of a single table wrapper (<table-wrap>) containing a one or more small tables that represent one logical tabular area. For example, one part of the display might be 3 rows by 10 columns, the next part might be 5 rows by 2 columns, and the last part may return to 10 columns for 6 more rows. Each tabular area can be tagged with a NISO JATS <table> element, and paragraphs of text may be interspersed between the tabular material. In the United States, tax tables are frequently this type of table. By default, this Tag Set uses the NISO JATS XHTML-inspired table model (based on and designed to be converted easily to the XHTML 1.1 Table Model). This model matches the needs of web browsers and can support (at least roughly) most table display formatting. Format is indicated in one of two ways in a NISO JATS default table: using multiple single-purpose attributes for simple formatting, or making more complex formats using the @style attribute. @width controls the width of the entire table or columns within the table. All the tables just shown are all relatively simple formats. More complex table formatting is done using the @style attribute, which contains CSS instructions. 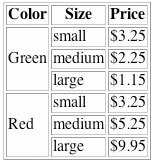 Key to understanding how the CSS in tables works is that instructions on smaller portions override those on larger portions of the table. 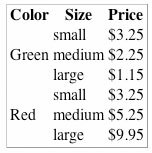 For example, if a background color is provided for the whole table and a different background color is specified for a row, everything in the table will be the first background color except that row, which will have the second. Similarly, if borders are specified for a <colgroup>, they will apply to the whole <colgroup> unless a different border is specified for one cell (<th> or <td>), in which case that cell will have the override. Here is a sample, in code and image, of a relatively complex table, formatted using a variety of techniques including CSS in the @style attribute, controlling alignment with the @align attribute, and a few spans. By default, this Tag Set uses the NISO JATS XHTML-inspired table model, as defined in the NISO JATS XHTML Table Module. To include the NISO JATS XHTML-inspired table model in a tag set, a DTD must reference this module. NISO JATS XHTML-inspired Table Style Module (xhtml-inlstyle-1.mod) Declares the @style attribute, which supports inline style markup for elements such as <td> and <tr> within NISO JATS XHTML-inspired table.